As the Emperor protects, so must we. One of my favourite genres in video games is the isometric hack and slash dungeon crawler. From Champions of Norrath to Marvel Ultimate Alliance, to Diablo and the fantastic Path of Exile, it is a genre that I have truly adored and admired. However, apart from Demons, Orcs, and Dr. Doom, one genre that has been largely neglected when it comes to this type of game is pure space-based sci-fi. While 2015's Helldivers did manage to be a fairly entertaining title, it failed to be memorable or leave a lasting impression like other titles of its ilk. 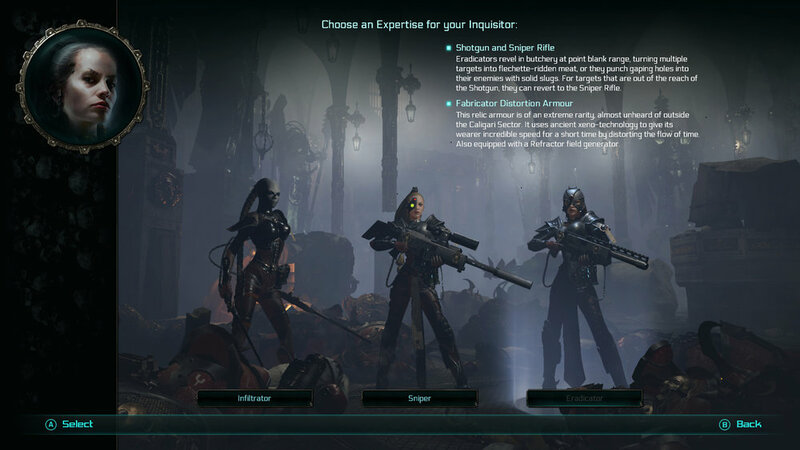 Warhammer 40K - Inquisitor: Martyr is the latest sci-fi based hack and slash dungeon crawler to see a release and while it is certainly fun and action-packed, the title is certainly rough around the edges. The Warhammer series has had a vast array of video game adaptations spanning numerous generations of consoles and PC operating systems. While my experience with the brand is limited to a few titles such as Warhammer 40K: Space Marine and the Vermintide series, I've always enjoyed the character designs and the overall look and tone each franchise has brought to the table. While my knowledge of the lore is minimal at best, I was still able to grasp much of what took place in the lengthy story campaign and numerous side missions offered. 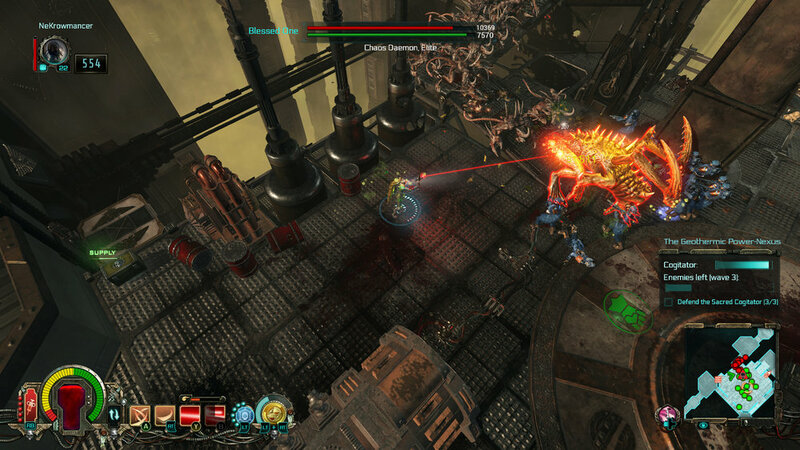 Set in the Caligari sector, which was created solely for this release, developer NeocoreGames takes full control and ownership of this new section of space in the Warhammer universe. While long-time fans might be disappointed that we don't explore any well-known locations, it does allow the developer to create something fresh and original and allow even the most diehard fans to explore strange new worlds. Before you embark on a tale of conspiracy and long-lost secrets, you'll be tasked with creating your own Inquisitor. You'll choose from the typical holy trinity of Mage, Warrior, and Rogue via the psychic powered Psyker, the battle-hardened Crusader, and the deadly Assassin. Each of these three allows you to select a starting expertise that has you begin with a certain armor type and weapon set. While you can switch these items out back at your ship, each expertise will have you earn certain weapons faster and gain access to several skill tree selections at the start of the game. While my entire first playthrough was via the Assassin, I am currently diving back in as a Psyker, enjoying my time setting things on fire and shattering nearby threats with my shockwave abilities. What I like most about each of the characters is not just the variety of their abilities and attacks, but the different personalities that each of them has. Playing through a second time, it is refreshing to get almost entirely new dialogue spouted from my second Inquisitor, instead of the same lines repeated by numerous actors. While the voice acting across the entire spectrum of the game isn't applause-worthy, there are certain times where the performances truly stand out. That said, any character that is talking into a breathing apparatus or through some form of mask can be next to impossible to understand while you are taking fire or deep in the blood of your enemies. While you can read the subtitles or text provided, I found numerous moments where the voices and text didn't line up and either skipped out on much of what should have been said or had entirely new dialogue altogether. Starting a new game will push you through a tutorial on the Martyr, a ship that will be the battleground for much of the campaign. While the tutorial does its best to introduce you to new mechanics and many of its complex systems, there are several aspects to the game that are not conveyed as good as they could be. Eventually, you'll gain access to additional personnel on your own ship and each of these NPC's will operate as a vendor to various goods, crafting services or allow you to customize the healing properties of certain items. The problem is that unless you manually dive into the text-heavy tutorials yourself, you may miss out on what each of these characters can actually do for you. The tutorials themselves will often pop up during combat or during dialogue moments and it can be fairly easy to miss a lot of those prompts. When you first encounter a group of marines that are yours to control, the tutorial message that pops up mentions that I should use the F key to command them. The F key, on a controller? Really? Still haven't found it. The main story is built around the Martyr, a ship that by all records shouldn't exist and one that houses a dark secret. While you start out on the vessel itself, it isn't long before you are attempting to track the ship back down after it warps away to the vast reaches of space. The missions that are based around recruiting help to relocate it are some of the best here and see you often adventuring outside, a luxury that you'll often take for granted. Some locations, such as those covered in snow and ice are stunning not only viusally, but with superb audio of hearing the snow crunch under your very boot. While I did enjoy the story and its cast of characters, the bulk of the game does take place on the ship and it can become very repetitive seeing the same overall design elements used again and again due to how the game randomly generates its locations. While some of this repetition can be solved by alternating missions with random side quests, even those can start to wear thin, especially if they involve being on board another ship or a map so large you barely see any opposing forces. While Martyr does allow for co-op play with another local player or through online matchmaking via a variety of different modes, the main campaign itself is structured for single player only. Co-op is an absolute blast fighting alongside other inquisitors and will certainly add to the enjoyment factor should it be with a group of good friends. Should you share the screen with another local player, their Inquisitor will be premade from a selection of nine characters and be unable to change their loot, weapons, interact with NPC's or join the main player in any form of online matchmaking. While it's great that you can have this couch co-op experience, the major drawback for the second player is the inability to take part in the loot systems that the game is literally built around. Side activities apart from the main campaign are in the form of Side quests, Tarot missions, Priority assignments, PVP, and Weekly Challenges. Side quests are as simple as escorting a VIP to safety, decimating all the enemies on the map, or tracking down Intel and like the campaign missions themselves, these are kept to being a fairly short experience. Tarot missions have you select from a series of cards to create custom missions to have certain items drop as well as tackle specific enemy types. Priority assignments are smaller missions that are connected together to create a small narrative campaign. PVP felt somewhat unbalanced as in the few times that I tried it I was either paired alongside someone ranked well below me or far above me making it a challenge for only one of us involved. Weekly Challenges will garner you some pretty decent loot should you collect enough Glory before the weekly reset. While you can earn Glory on a few missions at regular difficulty, it is earned much faster by increasing the challenge for the main campaign missions. Exploring the vastness of space via the HUB station that is your ship, is through a Mass Effect type system of selecting travel destinations on the map and then those open up more areas to explore. Each location is designated with a Power Rating system that is tied to your weapons and armor. 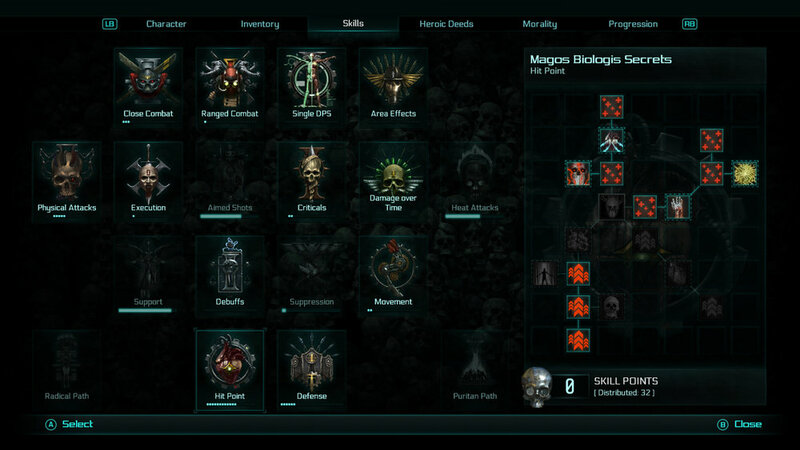 For example, selecting the Data Hunt mission aboard the Chaos Legion Vanguard is a 678 Power Rated mission. With my power rating being 719 at the time while selecting this mission, I was presented with a +11% damage dealt bonus as well as a -13% damage suffered bonus. If this had been a story mission, I would have been able to increase the difficulty and those bonuses would be lessened considerably. The Power Rating system as I've said is tied to your gear and it can almost feel counter-intuitive to what you want to equip and what you need to equip to reach that next Power rating level. As you track down, craft, or buy new loot, each item will be packed full of stats on how much damage it does, how much defence it grants you and a whole selection of other stats. One of the most important aspects to those items is the Power Rating attached to them, identified with a little fist icon. Going on a mission with a lower rating than what you are currently rocking will always make the mission easier and falling behind the rating of your next mission is an easy way to end up as paste on the floor. The problem is that you'll often encounter items that will have far better stats than what you have equipped but the Power Rating will sometimes be lower. Now, this isn't all the time, but I've come across certain weapons that had very good stats and would be 10 or 15 points lower than what I currently had equipped and the opposite is true when you find something with mediocre to poor stats but the item is 30-40 points higher. Eventually, I ended up having Power Rating play the more dominant stat as the bonuses that I earned going into missions would more than compensate for the lack of useful stats on the weapons themselves thus undermining many of the stat systems in play. 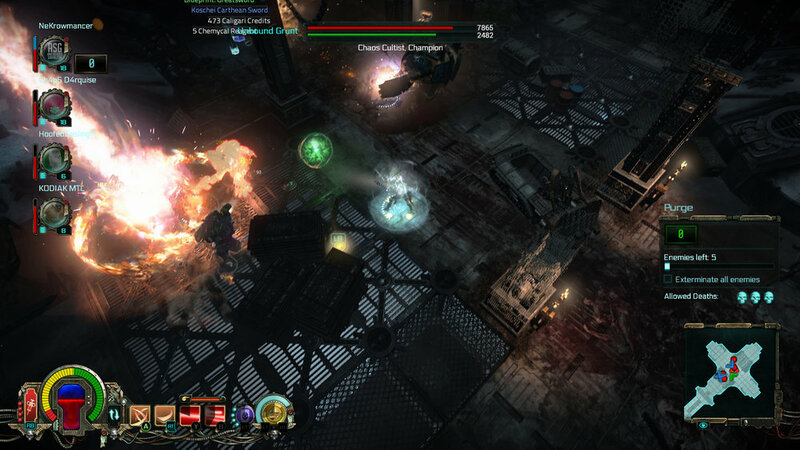 Martyr features the type of combat that you find in most isometric dungeon crawlers. You'll have attacks and special skills attached to various buttons and using those attacks will often trigger a cooldown before they can be used again. There is the addition of taking cover behind objects, but given the horde mentality of how many of the enemies are programmed to think, the cover system was something I rarely ended up using. It also doesn't help that many objects in the environment didn't support the cover system and just led to further confusion. As you can swing the camera around with the right analog stick, this forces the shooting and melee combat to be auto-targeting based instead of directional based. This system causes the game to target for you and it can often make poor choices and select enemies that are not even close to you or prevent you from entering a turret because it wants to attack an enemy or explosive barrel instead, making the turret only accessible once everything was dead, rendering it pointless. The targeting system in play doesn't ruin the game in any real way but it does give it a very clunky feeling that could have been avoided should you been able to shoot and stab in the direction you wanted instead. Targeting systems aside, Martyr has very satisfying combat that remained incredibly enjoyable right to the very end. Each kill is brutal in all the right ways a Warhammer game should be and the vast selection of weapons and abilities kept making each encounter varied and interesting. Rampaging into a room and triggering your shield ability and then launching a full-scale beatdown is beyond satisfying when everything around you disappears into a red or green pulpy mist. The shotgun packs all the punch you expect and seeing enemies disintegrate into ash via a laser pistol shot will always put a smile on your face and each of the various swords will cut down most enemies in a single swipe. The weapon selection is largely impressive as are the varied skills you can equip, even if I couldn't find details about what many of them did without equipping them and taking them into the field for a test drive. You can equip two loadouts per character when stationed on the ship and you'll keep these loadouts until you return from the mission, meaning you are stuck with a certain skill you may not enjoy using until you either quit the mission or complete it and return to the ship. Bullet-type guns will reload when empty and laser pistols can overheat when they are used to exhaustion, forcing a literal cooldown upon you until it is ready to be used again. I found a nice balance of having a one-handed sword and laser pistol on one loadout and a sniper rifle on the other, giving me a strong balance of all three range types. The Assassin class is a lot weaker than the other two and therefore has a dodge roll that is incredibly useful and one that I relied on so much that I kept trying to roll with my Psyker, to no avail. While the controls for combat and using the skills and abilities of your weapons is very solid, the responsiveness for your special attacks and support items don't quite measure up. You can equip grenades or shields and other items for use with the left trigger and the right trigger is going to be a button used for one of your key weapons. By pressing both together, you'll unleash an attack or some form of defensive skill like an area effect that slows down the bullets around you. The problem I had with almost every time I wanted to use my special attack is that it would often not work and end up using one of my grenades or shields instead, an ability that is finite unless you find more in chests around the environment. Martyr is a very good looking game that fits well within the Warhammer design. Floors are layered in blood, enemies have all the right details, and the varied selection of armor will allow you to consistently change up the look of your Inquisitor. The only thing I can't show in the collection of screenshots here is the inconsistent frame-rate that plagued my experience on the Xbox One X and I've heard it's also very apparent on the PlayStation 4 Pro as well. While I would love to say it only happens when the screen is filled with numerous enemies, I've had it stutter several times while exploring a random empty hallway. I've also had numerous audio errors where my sound stopped working and several instances of hearing marines around me when I was completely by myself. I've also had the game crash on me twice as well as being dropped from the server while nearing the end of several missions, forcing me to have to restart them all over again. I know I've been somewhat harsh on Inquisitor: Martyr in regards to several of its shortcomings, but there is a solid game here that is very enjoyable. Apart from the targeting systems in play, a lot of issues like framerate or the rampant audio issues are things that can be fixed in future patches. What Martyr lacks, unfortunately, is polish. Nearly every aspect of the game has noticeable flaws that lessen the experience in some ways but rarely ever distracts enough to ruin it. 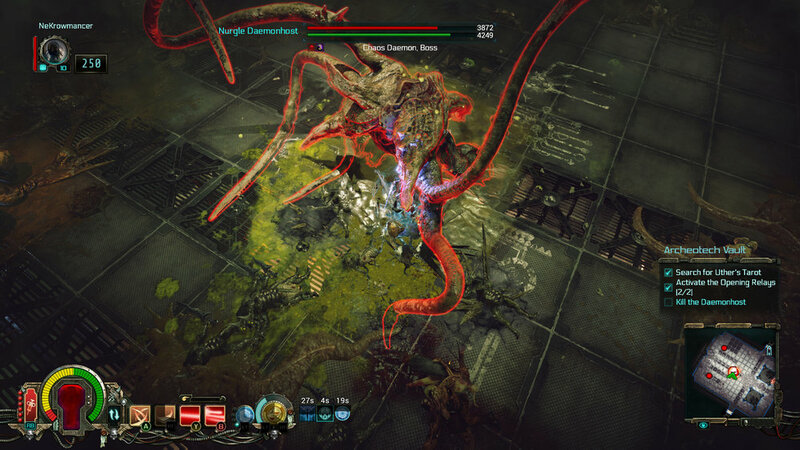 Combat is first and foremost something that needed to succeed in a Warhammer game and NeocoreGames does an excellent job translating this franchise into a Diablo-style dungeon crawler. What is going to hurt Martyr the most, however, is being released so close to some big games that are about to dominate the fall's gaming lineup. 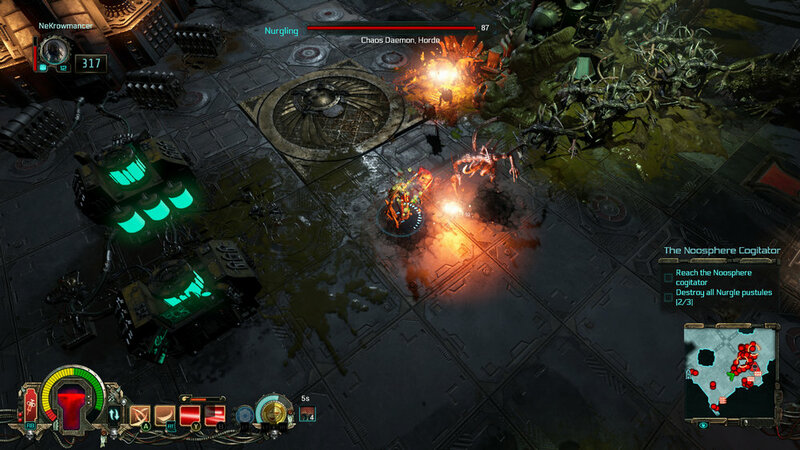 If you enjoy the Warhammer franchise or the team's previous efforts with The Incredible Adventures of Van Helsing, then give this game a chance and it just may surprise you. A review copy was provided by the Publisher for the purpose of this review. All Screenshots were taken on an Xbox One X.